Inspired by the cosmopolitan district of London, the Knightsbridge Collection is characterized by classic elegance and upbeat sophistication and features deep cuts on a delicately round shape, reminiscent of a flower. Not dishwasher or microwave safe. 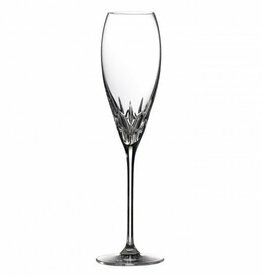 Beautiful carving topped off with an elegant platinum rim. Bubbles are just prettier in a flute like this. Get a pair for your favorite celebrations for two!